New Ministry of Justice figures show fewer separating couples now attend family mediation than before the devastating legal aid changes of 2013, despite government measures of the past 12 months aimed at encouraging people to seek settlements away from courtrooms. “In their bid to boost the take-up of mediation, Ministers have already played a number of cards yet the national mediation data remains doggedly low,” said Jane Robey, CEO of National Family Mediation (NFM). “Ministers are right to seek culture change so that mediation becomes the first port of call for divorcing couples. “Family court judges must be more willing to embrace mediation, using the powers they already have to direct people who come before courts towards alternative means of settling disputes. “We need Ministers to bang the drum for mediation, and to join up with other government departments to do so. For the past year the Department for Work and Pensions has been funding NFM’s pilot ‘at court mediation’ project, which helps parents who have been separated for more than two years and are currently in the family court system to suspend legal proceedings and meet specialist mediators to negotiate long-term arrangements for children, property and finance. “The successful project shows that couples who have become entrenched in conflict can, with the right help, find an exit from the courtroom drama and move on in a positive way. The new legal aid mediation data for January to March 2015, issued by the Ministry of Justice, shows that whilst the number of mediation starts is up on previous quarters, it has not yet returned to the higher levels before the introduction of 2013’s LASPO Act. It also shows a decline in the national success rate of mediation compared with the same quarter in 2014. “The data can be seen as evidence that many separating couples simply see the compulsory mediation information meeting as a hoop to jump through on the way to court,” added Jane Robey. Last month the UK’s most senior judge, Lord Neuberger, said mediation is particularly suitable for “ordinary people” and “average citizens” in the current economic climate. In April 2014 the government made it compulsory for couples to attend a mediation information meeting before they could apply for a court order, and have since begun a scheme making a mediation session free for both parties where only one is legally aided. Respecting the human rights of a terror suspect is not a sign of weakness, it is a sign of what makes us better - Well, that was my original title of the post anyway, as prompted by the 'ankle tag' case DD v Secretary of State for the Home Department. “It is not enough to show that a child could be placed in a more beneficial environment for his upbringing.” - My original title for a post on the “unusual and difficult case” of Re S & T (Children). Lord Chancellor gives speech - As I thought I got the hang of writing post titles, but clearly didn't, a few words about the first speech of our new Lord Chancellor. 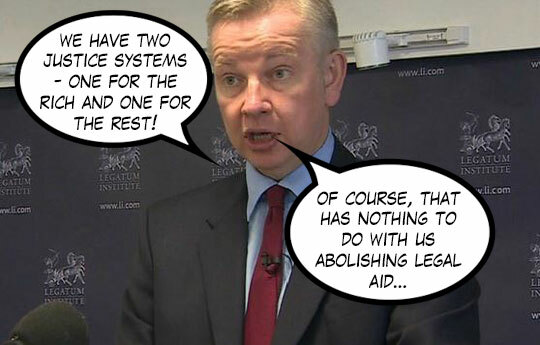 Gove ignites pro bono debate - Finally I do get the hang of writing posts titles. Twitter reacts to Mr Gove's suggestion that successful lawyers should do more pro bono work. 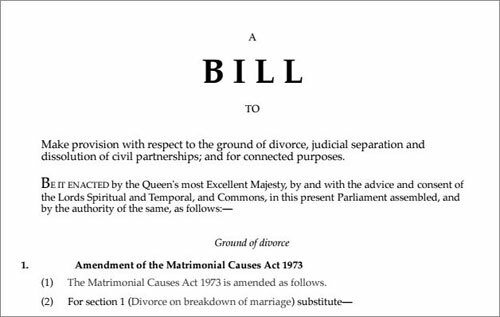 My long-term fellow legal blogger, friend and occasional Twitter sparring-partner Carl Gardner has drafted a no fault divorce Bill, which you can peruse here. The Bill was prepared at the suggestion of campaigner and policy researcher Ellie Cumbo, who explains her thinking here. As I have often said, we really need no fault divorce, to reduce unnecessary animosity and bring our system into line with the modern world. Carl's Bill does a great job, much simpler and better than the ill-fated Family Law Act 1996 (not that that's difficult!). Are the terms ‘custody’ and ‘access’ really degrading? 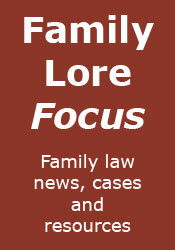 - It has been suggested that continued use of the pre-Children Act terms is degrading. Is that really so? Re H and relief from sanctions - A short note on the subject of relief from sanctions, prompted by the Court of Appeal decision in Re H (Children). It’s about the child, not the parents - As demonstrated in the case RC (Mother) v AB (Father), amongst many others. Dads who face the misery of divorce or separation can secure a priceless gift this Father’s Day, says a national charity. “Most fathers think the only way to manage their divorce is a solicitor-led courtroom battle with their ex,” says Jane Robey, Chief Executive of National Family Mediation. “Dads who open their eyes to a different way of doing things will find a Father’s Day gift tailored not just for them, but for all members of the family. “If you go to court you’re likely to still be battling it out NEXT Father’s Day, because statistics show it can take an average of 435 days to resolve a divorce taking that route. “All this time you’ll experience heat, bluster, resentment and, ultimately, a settlement that could suit nobody. If you use mediation, things can be settled long before winter sets in, with solutions geared to your family’s needs. “Taking the chance to influence the shape of your separated family for the next few years is a gift that money can’t buy,” she added. Expert professional family mediators help separating couples agree settlements on property, finance and parenting issues without the need for a courtroom drama. 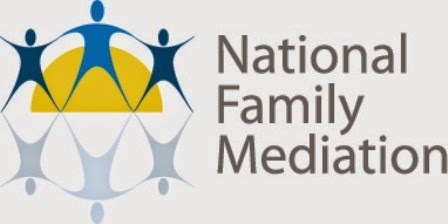 National Family Mediation achieves full agreement in over 80 per cent of cases. National Audit Office figures on legally-aided mediation show family mediation is four times quicker than using the court route, typically taking 110 days - compared with 435 days for court cases. To find an expert family mediator close to you, call 0300 4000 636 or enter your postcode at www.nfm.org.uk/local. The transparency delusion - Why the devotees of transparency are knocking their heads against a brick wall. The guardian of standards - I.e., the court, as demonstrated in Medway Council v A & Ors (Learning Disability; Foster Placement). What is the point of the fraud and contempt warnings on Form E? - A question raised in the light of the Sharland and Gohil appeals, being heard by the Supreme Court this week. Criminal consequences - The remarkable case of Kaur v Randhawa. Top global law firms Allen & Overy and DLA Piper have teamed up with leading children's legal charity Coram Children’s Legal Centre (CCLC) to launch a new collaborative legal project that will help hundreds of children currently without legal support to access their rights. The project will provide quality, free-of-charge legal representation so that children with a right in law to become British citizens can exercise that right. The Children’s Pro Bono Legal Service will be led by a solicitor at CCLC, who will supervise volunteer lawyers from the partner firms in undertaking pro bono legal casework. Unlike many other pro bono projects, this ground-breaking new service will offer end-to-end legal representation to children and families so that their cases are seen through to full completion. Many of the children and families assisted by the project are amongst the most vulnerable in the UK and would otherwise be unable to access any legal assistance in an area of law where no legal aid is available. 'By involving volunteer lawyers from our partner firms we can deliver a much-needed, high-quality service for children who have the legal right to become British citizens. Often children in these circumstances have to rely on piecemeal or no legal support, whereas this model sees their entire case taken on from start to finish. Securing citizenship offers them stability and the chance to access the same opportunities as other children in the UK. The project has been generously funded for three years by Unbound Philanthropy. Can it really be a year since I reviewed the last edition of At A Glance? Well, no, it's just over eleven months, actually. I know the years seem to get shorter as you get older, but quite why the last one was a month less for this publication, I can't say. Moving swiftly on, At A Glance needs no introduction. Notwithstanding this, I shall give it one anyway, albeit a brief one. At A Glance has been published annually since 1992, with the intention of putting essential facts and figures at the fingertips of financial remedies practitioners, in one handy volume (which, unlike most legal texts, attempts to remain handy by not increasing in size every year). Such has been its success that it occupies a spot on the bookshelf or in the briefcase/bag of every family law judge or lawyer worth their salt. So, what is new or different about this edition (save, of course, for the updating of the contents)? Well, the first thing I noticed upon opening the cover is that the number of 'essential tables' has reduced, from 32 to 30. However, this does not necessarily mean we are getting less. The old House Price Index and Mortgage Costs tables have been merged into one 'Housing Costs' table. On the other hand, the old Annuities table has gone, its passing explained in the Preface as being a consequence of the pension changes in April. As to the other materials contained in At A Glance, these are as before, with the only difference I noted that the section on the President's Guidance on cases allocated to a High Court judge now has a new heading ('Efficient Conduct of Final Hearings') and also now includes the certificate referred to in the guidance. One last thing: if you are one of those who usually ignores the Preface to any new volume they acquire, please do at least find the time to read the last three paragraphs of the Preface in this volume, in which the merits and logical consequences of the Law Society's pet pre-nup initiative are discussed. I, for one, look forward to the suggested Pet Care Costs Corner table appearing in next year's edition. At A Glance can be purchased (at the slightly higher but still very reasonable price of £60) from Class Legal, here. 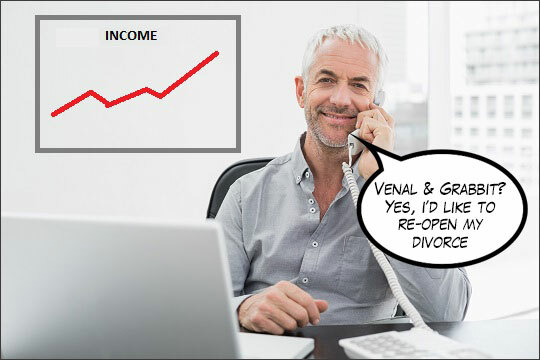 Unpicking family arrangements - In the case Gadhavi v Gadhavi. Lessons for parents from Dublin - In the Irish Court of Appeal case M.M. v G.M.. The rough and the smooth of family life - Memories of two cases I dealt with, prompted by the judgment in M v M.
I don’t like to say I told you so… - I am vindicated by the study that finds that the family courts do not discriminate against fathers.